Since Harley came out with their Twin Cam in 1999, it has gained a reputation as a motor that is fairly easy to modify for significant horsepower gains. Unfortunately, the Twin Cam's reputation for reliability seems to have lagged far behind, and not without reason. First there was the whole fiasco with the early cam chain tensioners. Seemed as though the life expectancy was anywhere between 20 and 30 thousand miles (though some did not make it that far). When they wore through the tensioner pad, things could get ugly in a hurry. Throw a little hearing loss on the owners part, and you get a cam chain wearing a hole through the cam cover (its true - I just rebuilt one with just that problem). An early response to the whole cam chain tensioner problem was the S&S gear drive cam set up. Its a legitimate fix, but it comes with its own issues, the main one being gear lash. Of course the whole idea behind the cam chain set up from Harley was to quiet the motors down by eliminating gear lash issues. 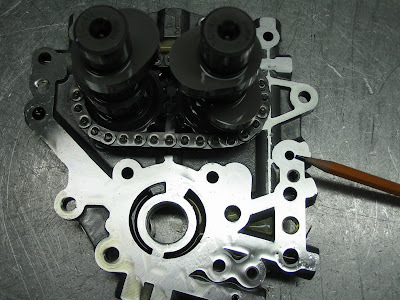 Only trouble with the gear drives is you now have two sets of gears to get the lash right in order to have a quiet motor; the outer pair which drive the rear cam off the crank, and the inner pair which drive the front cam off the rear one. Although S&S offers and oversize and and under size gear for each pair to aid in getting a good fit, every cam plate will give a different fitment. Too tight on the lash and the gears will whine; too loose and you get the old tappet type noise. After only seven years in production, the factory came up with a new solution for the early cam chain tensioner failure syndrome. Beginning with the 2006 Dyna models, and 2007 for the balance of Big Twins, Harley fit the Twin Cams with a new type cam chain system known as variously as hydraulic tensioned, or silent cam chains. Apparently the key to this new system is not so much the hydraulic tensioner as it is the type of chain itself. A quick feel of the outside edge of the chains (the part that the tensioner pads ride on) tells the real story. The early chains which were controlled by spring loader tensioner pads are down right sharp compared to the later chains! All that leads us to that venerable practice of upgrading old motors with later model part. Really, it is a custom that has flourished for many years, and involves everything from putting on an M74 carb in place of your M35, all the way up to the simple but ambitious practice of putting an entire Shovel top end on a Pan. The "late model parts on an earlier model bike trick" has been a staple of the Harley aftermarket as well as the Motor Company itself for years. The first I became aware of the possibility of upgrading the cam tensioners on '99-'06 Twin Cams was via the Kuryakyn catalog. They even list all the parts you need to purchase from your local Harley dealership to complete the upgrade. Included in the upgrade is the late model cam plate and the new higher volume oil pump, and of course Kuryakyn will be happy to supply a variety of cam grinds manufactured especially for this upgrade. Checking the Andrews catalog, I see they offer a whole kit with cam plate, oil pump, and everything else needed for the conversion as well as a full complement of cams specifically for this upgrade. Not to be totally outdone, Harley Davidson, via their Screamin' Eagle division also offer a kit. Harley's kit, however, leaves you stuck using the original "chainsaw" style inside cam chain. The reason they did this was so that you do not have to use a special cam; you can keep the one you have if it is still usable. The down side is that you are forced to keep the chain that contributed to the problems in the first place, and is the one hardest to service to boot. Seems to me it is only a solution to half the problem. Now, if you are thinking that you lean toward the Kuryakyn promoted solution, I have a couple of cautions for you. 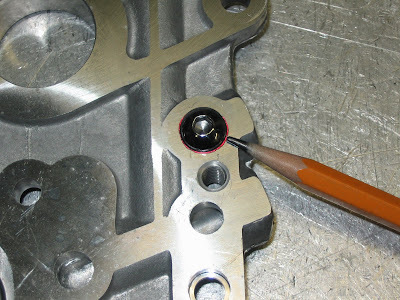 Since you are purchasing a cam plate that is not designated for use on the '99-'06 engines there won't be any warning label mentioning that on certain years of NON Softail models, one of the oil holes in the new cam plate will line up with ...NOTHING. That right, if you have a '99 (for instance) Dyna or FLT model, this hole which feeds the balance chain tensioners on "B" motors, will dump pressure oil directly into the cam chest. This will drastically lower your oil pressure, give you noisy lifters, and a flickering oil pressure light at hot idle. The solution is to simply plug the hole; in fact the procedure would have been outlined for you in the instructions if you had purchased a stock replacement cam plate for your early Twin Cam. The next caution has to do with cam sprocket alignment. From what I have seen so far, I am led to believe that Harley has machined every pinion shaft from 1999 until now incorrectly. Every shaft is machined for the diameter of the cam chain drive sprocket just inboard from the portion that rides in the cam plate itself. This machining includes a "flat" on one side which positively locates the sprocket. This machined flat is the problem. Admittedly I have only checked a half dozen crank assemblies, but the range from 1999 to two brand new fresh out of the shipping crate 103" cranks. 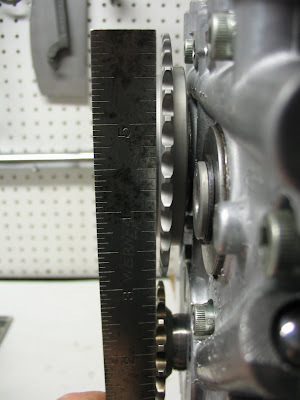 The specific problem is that the "flat" is machined deeper (further inboard) that the rest of the diameter for the sprocket by about .015". This causes the cam chain sprocket to pull in on that side when tightened. 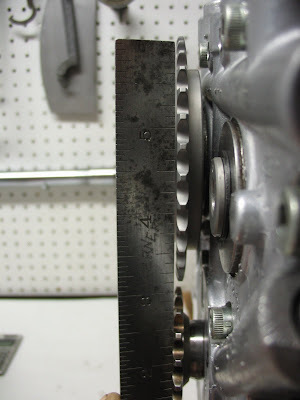 It gives said sprocket a similar amount of lateral runout, which in turn makes sprocket alignment between cam and pinion, shall we say ...interesting. There's not much you can do about the situation, as far as I can see, outside of being aware of the issue so that you can split the difference and minimise the misalignment between the two sprockets. If you were to simply follow the factory service manual and check the sprocket alignment, adjusting to within the Harley mandated .010, you may not think to turn the motor over 180 degrees and re-check. You may not think to, because the manual doesn't mention it. Whoever wrote the manual assumed (as most of us do) that the sprockets would install "square" on the shaft. Oops. Now you "get" the title that I chose for this piece; "wobbly" indeed. If that were the only place the factory went wobbly on the Twin Cam, it would be one thing, but it seems to be only the "tip of the iceberg", so to speak. How about the flywheels? Why is it that the specification for flywheel runout on my 1946 Knucklehead is within .001", but on a new Twin Cam it has become four times as much at .004"? Is that progress? Were the machine tools that much more accurate back then? A comparison of a 1999 Twin Cam service manual with its 2009 counterpart is revealing. In 1999 the spec for flywheel runout was .002 maximum. By 2009 that spec was doubled to .004". Not only that, but the service wear limit (deemed acceptable by the factory before repair) in 1999 was .003 for flywheel runout, but .005" ten years later. Note that the .003" runout which was the limit before replacement in 1999 would be within new setup spec for 2009. In 1999 the spec for pinion shaft runout was .003, and no service wear limit was given. In 2009 that spec, though renamed (to protect the guilty?) is .010" with a whopping (or should I say wobbly) service wear limit of .012! My conclusion? Harley reached its zenith for quality and engineering with the Evo motor. Of course they reached their zenith in just plain "class" much earlier with the Knucklehead!
" But the prophet, which shall presume to speak a word in my name, which I have not commanded him to speak, or that shall speak in the name of other gods, even that prophet shall die. And if thou say in thine heart, How shall we know the word which the LORD hath not spoken? When a prophet speaketh in the name of the LORD, if the thing follow not, nor come to pass, that is the thing which the LORD hath not spoken, but the prophet hath spoken it presumptuously: thou shalt not be afraid of him." As I write this, it is early in the morning on May 22 in Jerusalem. So Camping's date setting for the world's end has failed to come to pass, just as scores of other's before him. All that remains to be seen is how much scorn will be heaped upon Christians and the Bible because of his misplaced zeal. All that remains to be seen? Well, not quite. There is still the issue of whether or not his followers will flee this false teacher or if they will regroup under the banner of a new cult, which would be the usual pattern for these things. In the 19th century a preacher named William Miller predicted the second coming of Christ to happen between March 21, 1843 and March 21, 1844. When that didn't pan out, the date was delayed to October 22, 1844. Eventually many left the movement and those that stayed explained away the failed dates by teaching that it had been a spiritual return and not the physical one that the Bible teaches. Today this group is known as The Seventh Day Adventists. The Watchtower Society also has a history of setting dates for Judgment Day. 1914, 1915, 1918, and then 1925 as each date passed without God's response to their prophesies. The most recent Jehovah Witness prophesy of the end was for 1975; another bust. Are you starting to see a pattern between Judgement Day prophecies and cults yet? Time will tell whether Harold Camping and his followers will repent of their (good intentioned) heresy or go down the path of becoming a full blown cult. "Knowing this first, that there shall come in the last days scoffers, walking after their own lusts, And saying, Where is the promise of his coming? for since the fathers fell asleep, all things continue as they were from the beginning of the creation. " So, the bottom line is this: despite May 21, 2011 not being Judgment Day, Judgment Day is still coming. We are all still sinners in need of a Savior. Don't let false teachers divert your focus from that either by their next prophesy or by the failure of their last one. Jesus is our only hope. Just in case you haven't heard, Judgment Day is coming, and coming very soon according to some. This Saturday as a matter of fact, at least according to Harold Camping and his followers. Massive earthquakes, death, despair, and the end of the world as we know it. So, does that concern you, or do you just laugh it off? Mark 13:31-32 Heaven and earth shall pass away: but my words shall not pass away. But of that day and that hour knoweth no man, no, not the angels which are in heaven, neither the Son, but the Father. My natural instinct is to do some research on Harold Camping to see how he explains that verse and what seems to be his contradiction of it. Ah, but is that really the best use of my time? Now if I have not taken those verses out of context or misinterpreted them in some other way, then what's the harm in taking some time to delve into Mr. Camping's prophecy? Just this. By calling out this Saturday as Judgment Day, I believe all that Camping has done is pretty well insured that this Saturday will not be Judgment day! But that leaves the rest of this week and any day after as distinct possibilities. You see, while Harold Camping may be dead wrong on the day and the hour, one thing I cannot fault him for is having a sense of urgency. None of us is promised the next breath. So, what would be a better use of my time than researching the whole May 21 Judgment Day thing? One thing. Proclaiming the Gospel! In these verses, Paul gives us a kind of "in a nut shell" account of the Gospel, or good news. Notice where Paul starts out, "For I delivered unto you first of all that which I also received, how that Christ died for our sins ..." While that description of the Gospel does not leave sin out, it is only mentioned in passing. That, I believe is because Paul is writing to the Church at Corinth. A Church consists of born again believers; those who had already confronted the issue of their sin and found Christ to be their only hope. When presenting the Gospel to a lost and dying world, it is needful to go one step further back and talk about sin, for the lost either don't understand or don't care about their sinfulness. Sin, reduced to its primary definition, simply means to fall short. You may be thinking, "that doesn't sound so serious, what's all the fuss about?" Well, in all honesty, it would not be so serious if were not for whose standards we were falling short of. But the standards are those of the one who merely spoke and brought all of creation into being! The King of Kings and Lord of Lords! The Alpha and the Omega, the beginning and the ending! The one of whom the seraphim say Holy, Holy, Holy, the Lord of hosts: the whole earth is full of his glory! The one to whom one day every knee shall bow and every tongue shall confess! Oh that every man might get just a small glimpse of the glory and the holiness of Jehovah, how could they help but understand just what a "big deal" it is to offend him. It is only once a person begins to understand their sinfulness and begins to see the hopelessness of their case before the Righteous Judge that they can appreciate the grace and mercy extended by Christ Jesus in paying the penalty for their sins on the cross. And what a wonderful grace it is! It is the gift of God. Once armed with an understanding of the unfathomable holiness of God, there remain no silly thoughts that, in and of ourselves, we could in any way earn the forgiveness of our sins. The debt is just too large, too insurmountable. But the precious blood of Jesus was payment enough! And that leads us to the rest of Paul's statement about the gospel as found here in 1 Corinthians 15. Christ was buried, but he rose again on the third day just as the Old Testament had said he would ("according to the scriptures"). This is our proof that Christ's payment was acceptable to God the Father! This is our proof that we are forgiven. Now, you may notice that Paul's description here did not mention repentance. Does that mean that repentance is not involved in salvation? Certainly not, it merely means that Paul did not include it in his "nutshell" presentation of the gospel. Repentance, or turning from sin, is the natural result of coming to understand the enormity of sin and the overwhelming love shown by God in sending his son to die for that sin. If that doesn't lead a man to repent, then he certainly never received that glimpse of the holiness of God! So, rather than researching the teachings of Harold Camping about Saturday being Judgment Day, I chose to spend the time trying to give a presentation of the gospel. If the world as we know it ends this Saturday, I feel this was time well spent. If the world as we know it does not end this Saturday, I feel this was time equally well spent. Either way, time is short. Have you ever gotten a glimpse of God's glory, of his holiness? I suggest you start by reading the book of John. You may still have time. My first Harley was a Shovelhead, and way back when I started out in the motorcycle industry, Shovelheads were the "State of the Art" .... well, at least in the Harley world! In other words, I am no stranger to Shovelheads. In fact, I never did find myself calling them "Troubleheads" as some in the industry did after the Evolution motor de-throned the Shovel. Don't get me wrong, I am still a dyed in the wool knuckle guy when push comes to shove (or is that push comes to shovel? ), but I do appreciate a strong running Shovelhead. For that reason, I never did shy away from doing porting work on Shovels, though admittedly, those jobs came in pretty infrequently for a number of years. When I started building the Knuckledragger a while back, it got my friend Niel to thinking that it would be fun to build a hot Shovelhead for nostalgic reasons ...not a competition bike mind you, just something to make people shake their heads and wonder. To do that, of course, would take some fairly impressive head work. 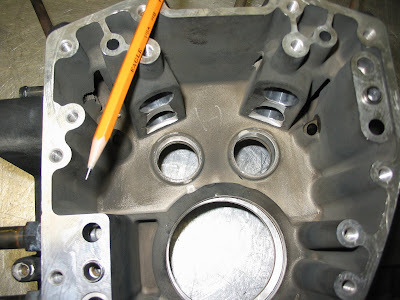 Well, that got me to thinking, and thinking got me to doing a little R&D work on Shovelheads for the first time in quite a number of years. It had seemed that I had sort of "hit a wall" when it came to flow on the Shovelheads that I had been porting over the years. I had some ideas that I wanted to try, but never seemed to find the time, or the right set of heads to work with for that matter. However, some time back a long time friend, Krazy Karl, brought in an engine that he had purchased as part of a basket case. Included with the engine were a brand new set of S&S Shovelheads. As it happened Karl wanted OEM heads on this build, and since he was short on money for the rebuild and I was short on Shovelheads for R&D work, we wound up doing some mutually beneficial horse(power) trading. Just to put this in perspective, somewhere around 25 years ago (give or take), I built a 114 cubic inch Shovelhead engine for my friend Neil Ryan's drag bike. (If you are paying close attention you may remember him from the beginning of this post.) In any case, this was just before I began porting heads, so he had the heads done by the legendary Dave Mackie. That motor, with those heads went on to run the world's first 5 second eighth mile pass for a Pro Stock Harley. The flow on those heads? Less than the "best ported" OEM heads shown above. Can you imagine the potential with an extra 30 cfm of air? So, as I await the finished version of the prototype valve I made up for the prototype head, the big decision is this: do I have the ports digitized so that it is easily reproduced through CNC porting? Is there enough demand to justify the cost? Hard to say. Anybody out there up for building a fast Shovelhead? May eighth is Mother's Day, and most of us have been blessed with a loving mother. Very many of us have also been blessed to have women in our lives who are loving mothers to our children and grandchildren. In honor of them, I would like to share a glimpse of a couple of mothers mentioned in the Bible. And Hannah prayed, and said, My heart rejoiceth in the LORD, mine horn is exalted in the LORD: my mouth is enlarged over mine enemies; because I rejoice in thy salvation. There is none holy as the LORD: for there is none beside thee: neither is there any rock like our God. Talk no more so exceeding proudly; let not arrogancy come out of your mouth: for the LORD is a God of knowledge, and by him actions are weighed. The bows of the mighty men are broken, and they that stumbled are girded with strength. They that were full have hired out themselves for bread; and they that were hungry ceased: so that the barren hath born seven; and she that hath many children is waxed feeble. The LORD killeth, and maketh alive: he bringeth down to the grave, and bringeth up. The LORD maketh poor, and maketh rich: he bringeth low, and lifteth up. He raiseth up the poor out of the dust, and lifteth up the beggar from the dunghill, to set them among princes, and to make them inherit the throne of glory: for the pillars of the earth are the LORD's, and he hath set the world upon them. He will keep the feet of his saints, and the wicked shall be silent in darkness; for by strength shall no man prevail. The adversaries of the LORD shall be broken to pieces; out of heaven shall he thunder upon them: the LORD shall judge the ends of the earth; and he shall give strength unto his king, and exalt the horn of his anointed. Hannah fulfilled her promise to God. Her son Samuel's life was indeed dedicated to God's service. In fact, later in life, Samuel, as the last of the judges of Israel, would be the one chosen by God to anoint King David. Hannah's story is a remarkable one, but in many ways it foreshadowed the story of another, even more well known mother mentioned in the Bible; Mary, the mother of Jesus. Mary had an astounding faith. In the book of Luke we read how an angel came to her and related how that she would bear a son who would be the long awaited Messiah. Her response was reasonable enough: she asked how that could be since she was a virgin. The angel then gave an even bigger piece of news. Her son would not only be the Messiah, but he would be the Son of God! Her response? "Behold the handmaid of the Lord; be it unto me according to thy word." In other words, I am God's servant, and I believe that whatever God says will happen. And Mary said, My soul doth magnify the Lord, And my spirit hath rejoiced in God my Saviour. For he hath regarded the low estate of his handmaiden: for, behold, from henceforth all generations shall call me blessed. For he that is mighty hath done to me great things; and holy is his name. And his mercy is on them that fear him from generation to generation. He hath shewed strength with his arm; he hath scattered the proud in the imagination of their hearts. He hath put down the mighty from their seats, and exalted them of low degree. He hath filled the hungry with good things; and the rich he hath sent empty away. He hath holpen his servant Israel, in remembrance of his mercy; As he spake to our fathers, to Abraham, and to his seed for ever. Now, if we compare Hannah's prayer with Mary's, we find many similarities. Both of them begin with rejoicing in the Lord and in his salvation. Both of them speak of the proud being brought low, and the humble lifted up. And is it any wonder that their prayers are so similar. Hannah showed her faith when she trusted that God would answer her prayer for a son. Mary showed her faith when she trusted God's word that she would bear the Messiah. Both of them understood that the proud, those who think themselves good enough to please God on their own merit, would be brought down. Both of them understood that the humble, those who understood they could never be good enough to measure up to God's standards, would be raised up by the mercy of God their Saviour. Hannah and Mary both had faith in the fact that God was their Saviour. Hannah had that faith long before her Saviour would come and die on the cross to pay the penalty for her sin. Mary had that same faith right at that point in time when Christ Jesus was about to enter into the world as the spotless Lamb of God. Both of them put their faith in the fact that God would show his mercy and provide a sacrifice for their sins. Now it has been done. Jesus paid the penalty for your sin when he died on the cross. All that remains is for you to put your trust in his promise that he will forgive all those who will humble themselves and come to him, repenting of their sins.